Make an entrance with this beautiful dress by Beige Label. 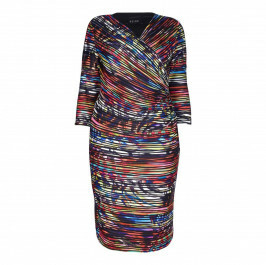 Stunning with a wrap style design, the dress comes with a textured pleat-like fabric, flattering v-neck and three-quarter sleeves for enhanced coverage. Ideal for smart dress codes. Wear with a nice pair of heels. Print black dress with wrap style and pleat-effect. 85% Polyester, 15% Elastane Lining, 100% Polyester. Hand Wash Only.